A media kit (or press kit) is a document that includes information about your business along with different brand resources which are put together for reporters and media contacts who want to write about your company. Create a Media Kit - It's free! Your starting point to create and share a beautiful media kit, without any design experience. Although a media kit is not a guarantee you will get press coverage, having one will make it a lot easier! 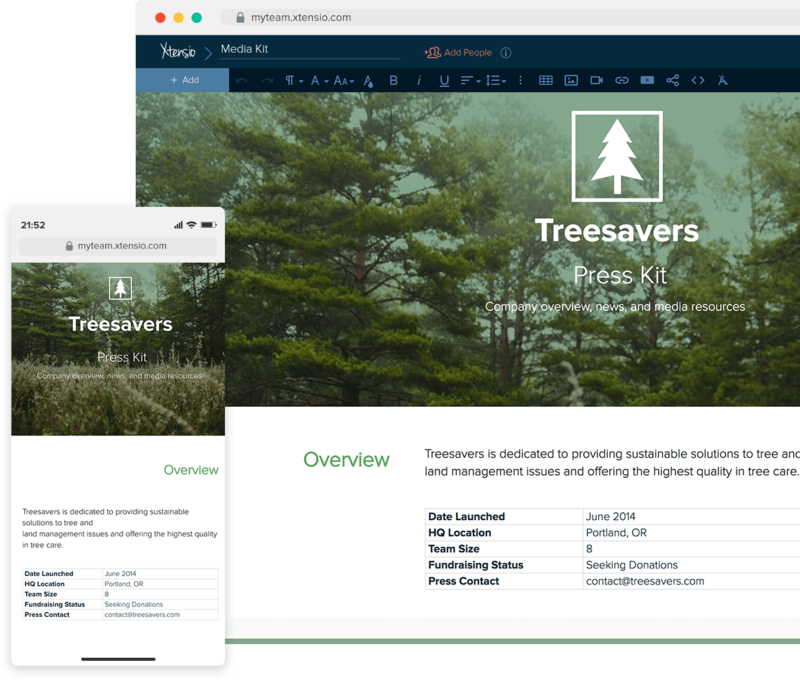 Showcase your products, services and company milestones to professionally present your company’s story to bloggers, podcasters, and even investors. Quick tip: Make sure the contact info is up-to-date. It’s also good practice to have a designated contact email address for press inquiries (e.g. press@company.com). 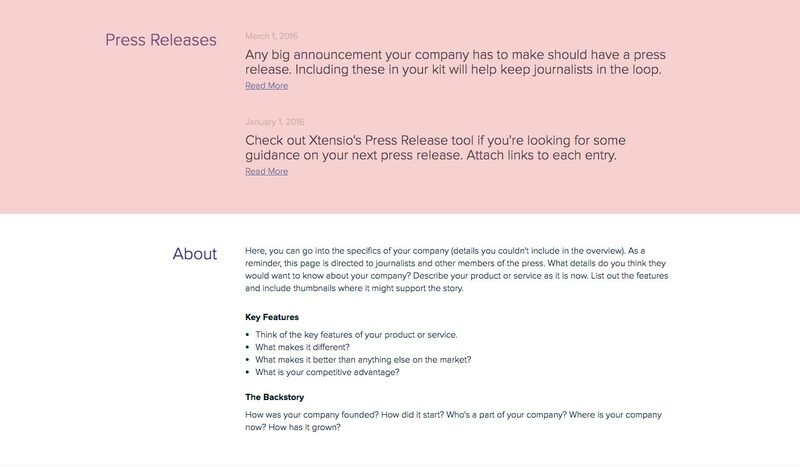 List your existing press releases chronologically, starting from the most recent. If you have many of them, just mention the important milestones with the most traffic and valuable information about your company history and vision. 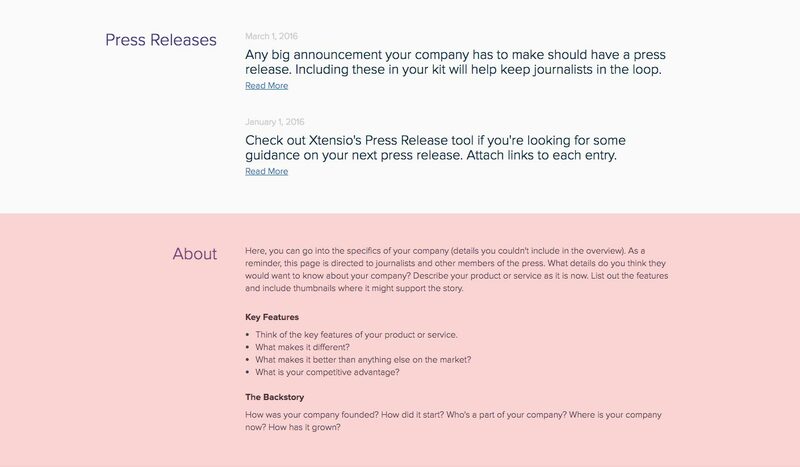 Bonus: If you are looking for an easy way to create beautiful press releases and update them whenever you need, take advantage of Xtensio’s free Press Release template. When was your company founded? A very short background will help the press get an idea of your company’s current stage. What are some of the key features of your product or service? What makes you stand out in your market? What is your competitive advantage in the market or your unique value proposition? Who your audience is can be a critical factor in a journalist’s decision to write about your product or service. If your audience naturally fits with their readers, they’ll be more likely to publish content about your company. On the flip side, if their readership doesn’t align with your market, the referral is probably not going to be your ideal customer anyways. That being said, you want to make sure you clearly define and describe your market. Quick Tip: Avoid unnecessarily long descriptions of your users. Concisely define your audience and visualize your target market with graphs and charts. 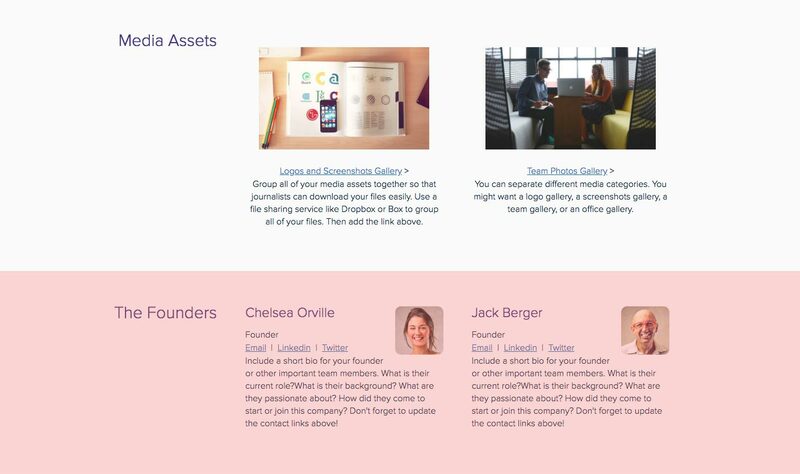 This will help draw a clear image of your users in the media’s mind and help you get referrals that convert. Publications and press mentions. Has your company already received media mentions? Include the post title, writer, and publication name along with a link. Quotes. Are there any quotes that would make a difference for the reader? Time to mention them. Publication logos. If you have an impressive publication logo and think it will be useful for your media contacts, then you should include this in your media kit resources. Company logo. If anyone wants to publish about you, they will need your logo to refer to your product or service. Have this ready in all formats that could possibly be required (transparent background and different sizes, brand colors). Team or product photos. Images make a powerful statement. 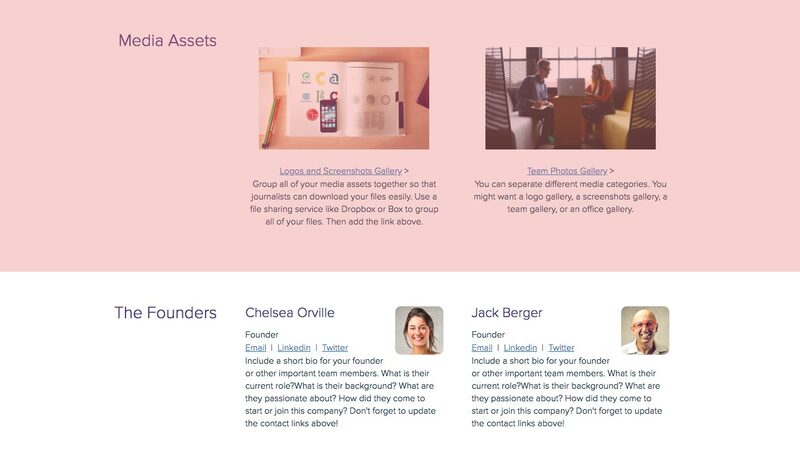 Include a recent team photo or showcase a product feature. Quick Tip: Make sure your media assets are easily downloadable. You can use a file sharing service like Dropbox or Box to group all of your files and then add the link in your Media Kit. Who founded the company or who are some key team members that are imperative to the company’s history? Give a short biography, describe their background and how it all started. Don’t forget to mention their current role in the company. Quick tip: This is another place you will need to make sure all the contact links are updated! You wouldn’t want to miss a chance to get published simply because of an outdated contact info. 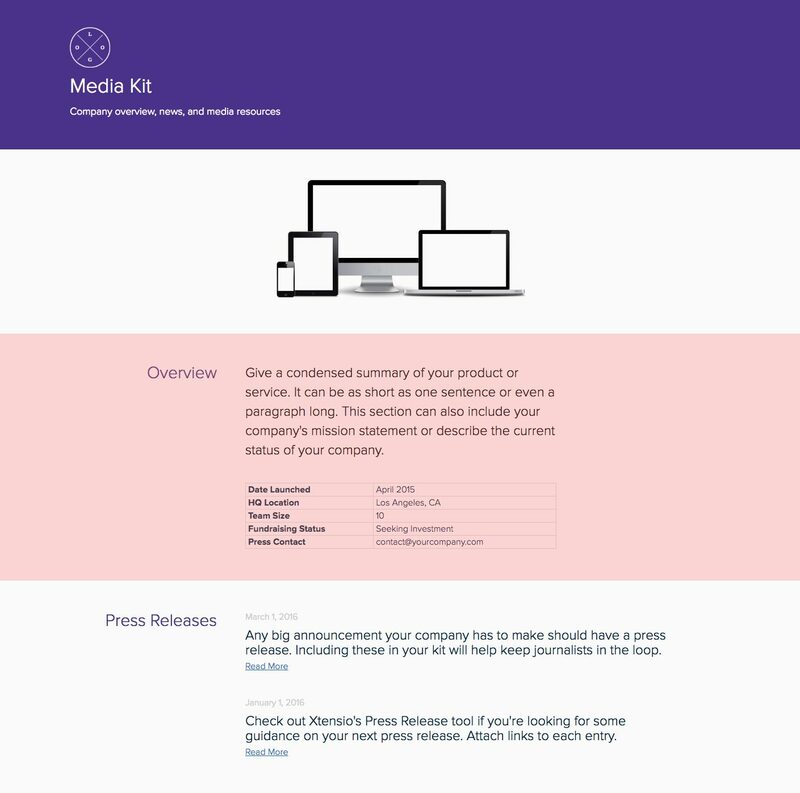 The media kit template is adaptable just like other Xtensio tools. It can and should be repurposed, revisited, and revised to suit your evolving needs. You can duplicate your folio to easily get started on the next one or save it as a template. And remember, all of our templates are meant to be starting points. You can always add, delete, and move your modules and sections around with Xtensio’s versatile editor to adapt the media kit to your needs.